Name Variation Herbert R. Ederer was also known as Herb. Name Variation Herbert R. Ederer was also known as Hubert. Herbert R. Ederer was born on 12 December 1901 at Plain, Sauk, Wisconsin. Herbert R. Ederer married Lucy R. Haas, daughter of John A. Haas and Anna M. Heiser, on 8 October 1929. 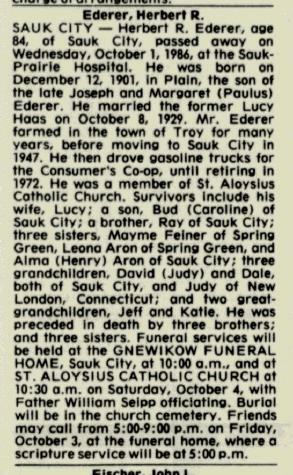 Herbert R. Ederer died on 1 October 1986 at Sauk, Wisconsin, at age 84 Herbert R. Ederer obituary. [S244] U.S. Federal Census 1910 U.S. Federal Census, by Ancestry.com, Year: 1910; Census Place: Franklin, Sauk, Wisconsin; Roll T624_1736; Page: 9B; Enumeration District: 115; Image: 898. Married Name Her married name was Aron. Leona C. Ederer married Milton C. Aron. 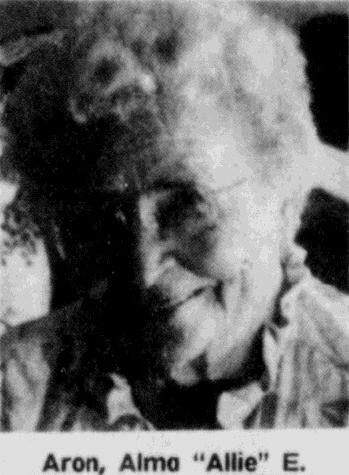 Leona C. Ederer was born on 17 December 1903 at Plain, Sauk, Wisconsin. She was the daughter of Joseph Ederer and Margareth Paulus. Leona C. Ederer died on 22 November 1994 at Spring Green, Sauk, Wisconsin, at age 90 Leona (Ederer) Aron obituary. Name Variation Alma Ederer was also known as Allie (?). Married Name 29 November 1929 As of 29 November 1929,her married name was Aron. Alma Ederer was born on 19 March 1908 at Wisconsin. Alma Ederer married Henry C. Aron, son of John C. Aron and Caroline R. Reuschlein, on 29 November 1929. Alma Ederer died on 24 May 1991 at age 83 Alma (Ederer) Aron obituary. Daniel Engel married Anna Born before 1835 at first marriage for her. Daniel Engel died before 1845. Married Name before 1835 As of before 1835,her married name was Engel. Anna Born was born circa 1805 at Switzerland. She married Daniel Engel before 1835 at first marriage for her. Anna Born married John Ulli Born before 1845 at second marriage for her; married to her cousin. 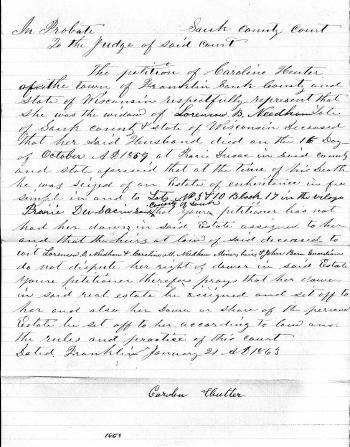 Anna Born witnessed the marriage of Soloman John Cramer and Mary Ann Engel in September 1851 at Sauk, Wisconsin; In September 1851, Sol Cramer, a carpenter by trade, married Mary Ann Engel by Nathaniel Mitchell, Esq., at the home of her stepfather, John Born. Anna Born died after June 1880. [S248] U.S. Federal Census 1860 U.S. Federal Census, by Ancestry.com, Year: 1860; Census Place: Franklin, Sauk, Wisconsin; Roll: M653_1429; Page: 579; Image: 145; Family History Library Film: 805429. [S247] U.S. Federal Census 1870 U.S. Federal Census, by Ancestry.com, Year: 1870; Census Place: Franklin, Sauk, Wisconsin; Roll: M593_1739; Page: 81A; Image: 167; Family History Library Film: 553238. Married Name September 1851 As of September 1851,her married name was Cramer. Mary Ann Engel was born in 1834 at Switzerland. She was the daughter of Daniel Engel and Anna Born. Mary Ann Engel married Soloman John Cramer in September 1851 at Sauk, Wisconsin, In September 1851, Sol Cramer, a carpenter by trade, married Mary Ann Engel by Nathaniel Mitchell, Esq., at the home of her stepfather, John Born. Mary Ann Engel died on 13 November 1882. Name Variation Soloman John Cramer was also known as Solomon. Name Variation Soloman John Cramer was also known as Sol. Soloman John Cramer was born on 3 March 1821 at Pennsylvania. He married Mary Ann Engel, daughter of Daniel Engel and Anna Born, in September 1851 at Sauk, Wisconsin, In September 1851, Sol Cramer, a carpenter by trade, married Mary Ann Engel by Nathaniel Mitchell, Esq., at the home of her stepfather, John Born. Soloman John Cramer died on 28 June 1906 at age 85 Solomon Cramer, one of a family of six children - three boys and three girls - was born in Pennsylvania, March 3d, 1821. Here, in his boyhood years, he chose carpentry as his vocation in life. Some years after his parents and family moved to Ohio. While living there he pursued the same trade until, in the year 1849, he came to Wisconsin, taking up a homestead in the town of Franklin in 1851, in what was then practically a wilderness. He was among the first of the earliest settlers in this vicinity, and by his own laborious efforts developed, cultivated and improved his land to the present beautiful farm and home that it is. In September, 1851, he was united in marrige to Miss Mary Ann Angel, by Nathaniel Mitchell, Esq. at the home of Mr. John Born. "A History of Plain" written in 1982 by Hildegarde Thering, page 5, paragraph 4, says: "On September 28, 1848 Sol Cramer located 320 acres in this area. In 1851 Adam Cramer, his son Joseph, Sol Cramer, and the mother of Adam and Sol Cramer arrived here from Ohio with wagon and the first team of horses to be seen here." Married Name 1856 As of 1856,her married name was Needham. Married Name 27 April 1862 As of 27 April 1862,her married name was Hutter. Caroline W. Engel was born in July 1837 at Switzerland. Caroline W. Engel married Lorenzo Bow Needham in 1856 at first marriage for her. Caroline W. Engel married George Hutter on 27 April 1862 at second marriage for her. 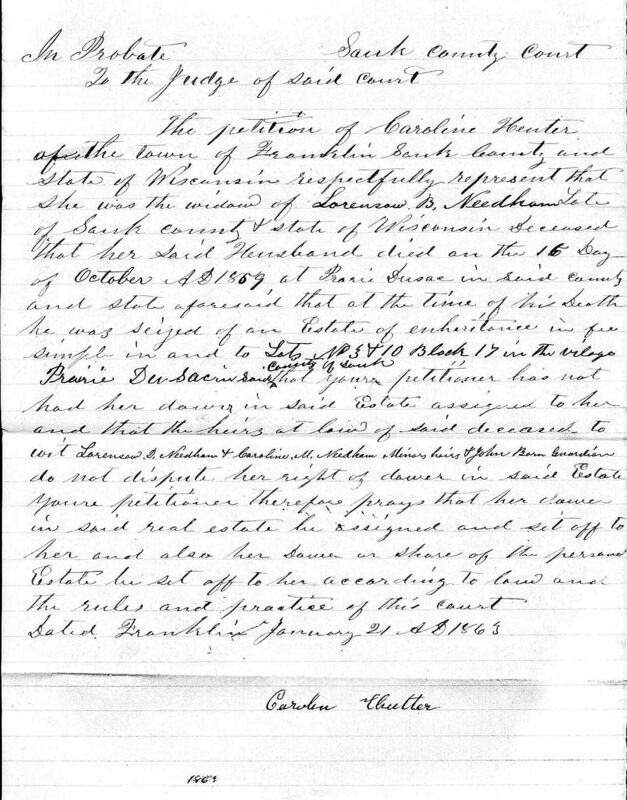 Caroline W. Engel was the executor of Lorenzo Bow Needham's estate on 14 March 1863 at Sauk, Wisconsin. Caroline W. Engel died before 1920. Caroline W. Engel immigrated in 1854. She had 12 with 9 living in 1900 children. [S247] U.S. Federal Census 1870 U.S. Federal Census, by Ancestry.com, Year: 1870; Census Place: Franklin, Sauk, Wisconsin; Roll: M593_1739; Page: 87B; Image: 180; Family History Library Film: 553238. [S246] U.S. Federal Census 1880 U.S. Federal Census, by Ancestry.com, Year: 1880; Census Place: Franklin, Sauk, Wisconsin; Roll: 1446; Family History Film: 1255446; Page: 104D; Enumeration District: 251; . [S244] U.S. Federal Census 1910 U.S. Federal Census, by Ancestry.com, Year: 1910; Census Place: Spring Green, Sauk, Wisconsin; Roll: T624_1737; Page: 3B; Enumeration District: 0126; Image: 37; FHL Number: 1375750. Lorenzo Bow Needham was born on 5 February 1826 at Massachusetts. He married Caroline W. Engel, daughter of Daniel Engel and Anna Born, in 1856 at first marriage for her. Lorenzo Bow Needham died on 16 October 1859 at Sauk, Wisconsin, at age 33. His estate was probated on 14 March 1863 at Sauk, Wisconsin. Name Variation George Hutter was also known as Georgie. Name Variation George Hutter was also known as Georg. George Hutter was born on 19 January 1839 at Bavaria, Germany. He married Caroline W. Engel, daughter of Daniel Engel and Anna Born, on 27 April 1862 at second marriage for her. George Hutter died in 1923 at Sauk, Wisconsin. George Hutter immigrated in 1854. He was naturalized in 1864. [S243] U.S. Federal Census 1920 U.S. Federal Census, by Ancestry.com, Year: 1920;Census Place: Spring Green, Sauk, Wisconsin; Roll: T625_2015; Page: 7B; Enumeration District: 178; Image: 461. John Ulli Born was born in 1820 at Switzerland. He married Anna Born before 1845 at second marriage for her; married to her cousin. John Ulli Born witnessed the marriage of Soloman John Cramer and Mary Ann Engel in September 1851 at Sauk, Wisconsin; In September 1851, Sol Cramer, a carpenter by trade, married Mary Ann Engel by Nathaniel Mitchell, Esq., at the home of her stepfather, John Born. John Ulli Born died on 10 May 1891 at USA. Married Name Her married name was Luther. Mary Martha Born married Heinrich Luther. Mary Martha Born was born circa 1845 at Ohio. She was the daughter of John Ulli Born and Anna Born. Heinrich Luther married Mary Martha Born, daughter of John Ulli Born and Anna Born. Name Variation Elizabeth Born was also known as Eliza. Married Name Her married name was Claridge. Elizabeth Born married George Claridge. Elizabeth Born was born on 12 September 1846 at Ohio. Elizabeth Born died on 31 May 1923 at Sauk, Wisconsin, at age 76. George Claridge married Elizabeth Born, daughter of John Ulli Born and Anna Born. Married Name 4 September 1869 As of 4 September 1869,her married name was Schoenmann. Margaret Rosina Born was born on 1 July 1850 at Ohio. Margaret Rosina Born married Frederick Gottlieb Schoenmann, son of (?) Schoenmann, on 4 September 1869. Margaret Rosina Born died on 4 June 1886 at Sauk, Wisconsin, at age 35. [S246] U.S. Federal Census 1880 U.S. Federal Census, by Ancestry.com, Year: 1880; Census Place: Franklin, Sauk, Wisconsin; Roll: 1446; Family History Film: 1255446; Page: 99B; Enumeration District: 251; . Name Variation Frederick Gottlieb Schoenmann was also known as Fritz. Frederick Gottlieb Schoenmann was born in November 1844 at Switzerland. He was the son of (?) Schoenmann. Frederick Gottlieb Schoenmann married Margaret Rosina Born, daughter of John Ulli Born and Anna Born, on 4 September 1869. Frederick Gottlieb Schoenmann married Emma Louise Luther circa 1888. Frederick Gottlieb Schoenmann died in 1932. [S245] U.S. Federal Census 1900 U.S. Federal Census, by Ancestry.com, Year: 1900; Census Place: Franklin, Sauk, Wisconsin; Roll: T623_ 1816; Page: 9A; Enumeration District: 134. Ann Born was born circa 1848 at Ohio. Justice Cooper married Hannah Kemp. Justice Cooper was born in January 1771 at New Jersey. Andrew D. Cooper married Lydia Jane Robinson. Andrew D. Cooper was born on 3 February 1804 at Pennsylvania. He was the son of Justice Cooper and Hannah Kemp. Andrew D. Cooper died on 30 April 1884 at Iowa at age 80. Married Name June 1847 As of June 1847,her married name was Butts. Mary Anne Cooper was born circa 1830 at Ohio. She was the daughter of Andrew D. Cooper and Lydia Jane Robinson. Mary Anne Cooper married Levi Butts in June 1847. [S249] U.S. Federal Census 1850 U.S. Federal Census, by Ancestry.com, Year: 1850; Census Place: Prairie Du Sac, Sauk, Wisconsin; Roll M432_1006; Page: 36A; Image: 74. [S248] U.S. Federal Census 1860 U.S. Federal Census, by Ancestry.com, Year: 1860; Census Place: Franklin, Sauk, Wisconsin; Roll M653_1429; Page: 569; Image: 135; Family History Library Film: 805429. Levi Butts was born circa 1813 at Virginia. He married Mary Anne Cooper, daughter of Andrew D. Cooper and Lydia Jane Robinson, in June 1847. Levi Butts died in August 1863. View Road from Lemuel Cooper who was Mary Anne’s uncle. Levi farmed this land until he passed away in August of 1863. Mary Anne Butts now widowed and the mother of five young children sells the property to her uncle Lemuel. Shortly after she moves to Union County Iowa near the Missouri border where her parents and most of her other family lived. James Butts was born circa 1849 at Wisconsin. He was the son of Levi Butts and Mary Anne Cooper. Sarah Butts was born circa 1851 at Wisconsin. She was the daughter of Levi Butts and Mary Anne Cooper. William Butts was born circa 1854 at Wisconsin. Susan Butts was born circa 1857 at Wisconsin. Mary Butts was born in March 1862 at Wisconsin. Married Name Her married name was Cooper. Lydia Jane Robinson married Andrew D. Cooper, son of Justice Cooper and Hannah Kemp. Lydia Jane Robinson was born in 1803 at Connecticut. Hannah Kemp married Justice Cooper. Hannah Kemp was born in 1783 at Pennsylvania. Name Variation Melvin J. Weiss was also known as Mel. Melvin J. Weiss was born on 29 March 1931 at Plain, Sauk, Wisconsin. He was the son of Zeno Weiss and Esther (?). Melvin J. Weiss died on 3 March 2011 at Arizona at age 79 We say goodbye to Melvin J. Weiss, just shy of 80, as he passed away unexpectedly, but peacefully, in the company of his beloved wife, Ione, on Thursday, March 3, 2011, in Arizona. Melvin was born on March 29, 1931, in Plain, the son of Zeno and Esther Weiss. Mel was a United States Navy Veteran having proudly served his country from 1955 through 1957. He was a happy farmer in Plain until 1973. Mel treasured the land he worked and was glad to go to work each day. Once a farmer, always a farmer, he would say. He then moved to Cross Plains, where he worked at Zander's Creamery for more than 25 years. He loved his job there and everyone he met. He was united in marriage to the love of his life, Ione on July 31, 1976, and they shared 34 wonderful years together. He always took time to enjoy his love of golf, gardening and his family. After retirement, he continued to enjoy life to its fullest. He and Ione spent the next 18 years as Arizona snow birds where they decided to make it their "home away from home" on a permanent basis. He was a member of the Knights of Columbus and had belonged to The Springs Golf Club for many years as well as a member of Eagles and American Legion in Lake Havasu. Melvin is survived by his soul mate and wife, Ione; daughter, Denise (Jeff) Zwettler; grandsons, Evan and Tyler; sister, Mary Feiner; and sister-in-law, Mickie (Bernard) Weiss; and two other special women in his life, Jane (Alan) Schoepp and Lyn (Greg) Coehnen plus many nieces, nephews, other relatives and countless friends. We will say farewell to our very kind, gentle soul with a Mass of Christian Burial at ST. FRANCIS XAVIER CATHOLIC CHURCH, 2947 Thinnes Street, Cross Plains, at 11 a.m. on Monday, March 14, 2011, with Father Thomas Kelley presiding. Visitation will be on Monday from 9 a.m. until the time of the service at the church. In lieu of flowers, please make a donation to the American Heart Association or American Diabetes Association.